The sky is falling- and you better repent, or it's gonna fall on yo head! 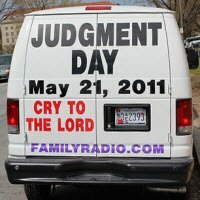 Deuteronomy 13:1-4: Any and all "prophecies"- either in the sense of foretelling or that of forth-telling- must square with the Word of God or they do not even warrant examination (though they may warrant the death of the prophet). Deuteronomy 18:15-22- the test for prophecy is retrospective. This has implications for how we speak about God's leading in our lives- "I know this will happen" vs. "I think the LORD will do this; we'll see; at any rate, He wants us to do this *right now*". A good example of this, from Doug Wilson's "Her Hand in Marriage", is the young man who comes a'courtin' and tells the young lady in question "I *know* you're the one God has for me. God told me we were supposed to get married." This is, for a number of reasons, not the right approach, but in light of this principle, the young man should be focused on walking in the Will of God now, and letting The LORD make evident His Will for the future. My Dad has been a good example of this, as well, on multiple occasions- from telling us that The LORD was going to do something big on his 40th birthday- Legacy Baptist Church﻿ met for the first time the day after Dad turned 40- to telling us that we were going to have another boy and name him Malachi. In each case, he stated these things in this manner: "I think The LORD is telling me this... but it could just be my head-noise," at once believing and heeding the Voice of the Spirit and acknowledging humbly the human aptitude for error. Scripture doesn't call us to predict the future or to discover it at any rate faster than 24 hours per day. We need to concern ourselves with walking in obedience to God *now,* not with figuring out the results. We can leave those to Him. Making wise observations, "knowing the times," having eschatological convictions, and listening to the Voice of the Holy Spirit- these are different, and necessary, and good. However, an eschatological position that predicts the specific time or temporal window of The End toes this line dangerously; to use those humanistic projections as reason to disregard and disobey written Revelation is to leap over the line glibly. To use our prophetic conclusions as evangelistic billy-clubs rather than standing on the Truth of the Word of God trades the Gospel for a mess of scare-tactic stew. Further, it does for the authority of the Church what counting to twenty does for the authority of the parent. God will indeed judge everyone, eventually. If we are faithful to proclaim His Lordship, it will not be necessary to stamp a scary-sounding expiration date on the globe. Every knee will bow at the Name of Christ one day- and the bowing part is a lot more important than the one day part. AMEN and AMEN!!! Love your post. You are so right about this. God leads, we follow, and we trust Him with all results as we go.He gives us the wisdom and we need to obey, but walking ever so carefully, redeeming the time, and being so sure we are in HIS will, not ours. Not my will, but thine be done! God Bless you as you strive to walk in His will!